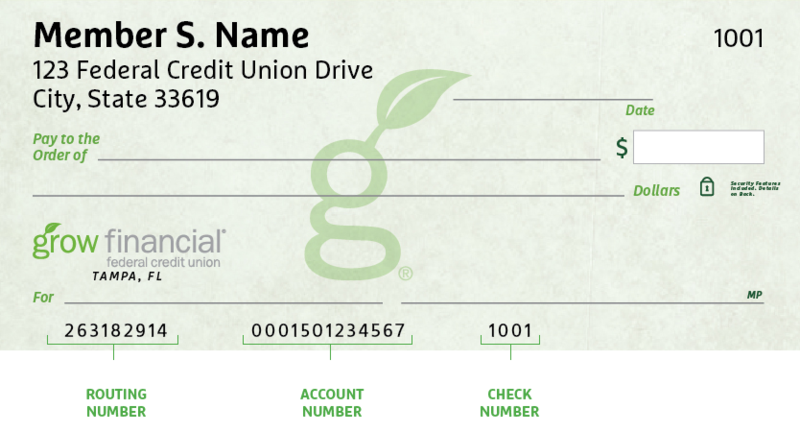 Welcome to the Grow Financial Federal Credit Union (“Grow”) website (“site”). This site is offered as a service to our members (“Members”). The following terms and conditions of use (“TOU”) set forth the basic rules that govern your use of the site. Your use of this site constitutes your knowledge, understanding, and acceptance of the TOU, and your agreement to be bound by the TOU. Grow may change, edit, modify, delete, revise, or update the TOU from time to time without notice, and your use of this site after any changes, edits, modifications, deletions, revisions, or updates are posted to the site constitutes your agreement to comply with the posted TOU. By using this site, you represent and warrant that you are at least the age of majority in your state of residence. If you are not the age of majority in your state of residence, you do not have permission to use this site. The trademarks, trade names, trade dress, logos, and service marks (collectively, the “trademarks”) displayed on this site are the registered and/or unregistered trademarks of Grow, or such third party licensors that may own the displayed trademarks. Nothing contained on this site or in the TOU serves to grant to you, by implication or otherwise, any license or right to use any trademarks displayed on this site without the written permission of Grow or such third party licensors that may own the displayed trademarks. The text, Trademarks, logos, images, graphics, photos, video files, application functionality, or any other digital media, and their arrangement on this site (“Content”) are all subject to patent, copyright, trademark and other intellectual property protection. Content may not be copied for commercial use or distribution, nor may Content be modified, processed, or reposted to other websites. Access to and use of this site are allowed solely for Member information and communication with Grow. You may download copy or print the Content of this site for your non-commercial limited use only. No right, title, or interest in any of the Content of this site is transferred to you as a result of any downloading, copying, printing or use of this site. To the extent that the sites may allow third-party links, those links may direct you to third-party websites that are not affiliated with Grow. Grow is not liable for any harm or damages related to the purchase or use of goods, services, resources, content, or any other transactions (“Third-Party Products”) made in connection with any third-party websites. Please review carefully the third party’s policies and practices and make sure you understand them before you engage in any transaction. Complaints, claims, concerns, or questions regarding Third-Party Products should be directed to the third party. Pursuant to our rights under the Digital Millennium Copyright Act (“DMCA”), 17 U.S.C. § 512, we have designated a copyright agent to receive copyright infringement notices for claims of infringement related to materials found on this site. Our copyright agent is Dierdre White, Chief Legal Officer. The agent can be reached at 813.837.2451, dierdre.white@growfinancial.org, or via U.S. Mail at: P.O. Box 89909, Tampa, Florida, 33689. Grow will take reasonable steps to promptly notify the alleged infringer that we have removed or disabled access to the content. The subscriber’s name, address, and telephone number, and a statement that the subscriber consents to the jurisdiction of the federal district court for the judicial district in which the subscriber address is located, or if the subscriber’s address is outside of the United States, in any judicial district in which Grow may be found, and that the subscriber will accept service of process from the person who provided notification or an agent of such person. In addition to other conditions as set forth in the TOU, you are prohibited from using the site or its Content: (a) for any unlawful purpose; (b) to solicit others to perform or participate in any unlawful acts; (c) to violate any international, federal, or state regulations, rules, laws, or local ordinances; (d) to infringe upon or violate our intellectual property rights or the intellectual property rights of others; (e) to harass, abuse, insult, harm, defame, slander, disparage, intimidate, or discriminate based on gender, sexual orientation, religion, ethnicity, race, age, national origin, or disability; (f) to submit false or misleading information; (g) to upload or transmit viruses or any other type of malicious code that will or may be used in any way that will affect the functionality or operation of this site, other websites, or the Internet; (h) to collect or track the personal information of others; (i) to spam, phish (email fraud), pharm (web traffic redirection fraud), pretext, spider, crawl, or scrape; (j) for any obscene or immoral purpose; or (k) to interfere with or circumvent the security features of this site, other websites, or the Internet. We reserve the right to terminate your use of the site for violating any of the prohibited uses. Please remember when reviewing information on this site that such information may not represent the complete information available on a subject. In addition, subsequent events or changes in circumstances may cause existing information on this site to become inaccurate or incomplete. On occasion, information on this site may contain errors, including, without limitation, typographical errors, inaccuracies, or omissions related to investment descriptions, or timeliness of account information. Grow reserves the right to, at any time without prior notice, correct any errors, inaccuracies or omissions and to change or update information or cancel services if any information on the site is inaccurate (including after you have submitted your order). The Content posted on the site is for informational purposes only; past results are not intended to indicate future performance, and Grow reserves the right to change the Content at any time. Grow reserves the right to discontinue any service offered via the site at any time. Any offer of services made on this site is void where prohibited. In addition to other conditions as set forth in the TOU, you are prohibited from using the site or its Content: (a) for any unlawful purpose; (b) to solicit others to perform or participate in any unlawful acts; (c) to violate any international, federal, or state regulations, rules, laws, or local ordinances; (d) to infringe upon or violate our intellectual property rights or the intellectual property rights of others; (e) to harass, abuse, insult, harm, defame, slander, disparage, intimidate, or discriminate based on gender, sexual orientation, religion, ethnicity, race, age, national origin, or disability; viruses or any other type of malicious code that will or may be used in any way that will affect the functionality or operation of this site, other websites, or the Internet; (h) to collect or track the personal information of others; (i) to spam, phish (email fraud), pharm (web traffic redirection fraud), pretext, spider, crawl, or scrape; (j) for any obscene or immoral purpose; or (k) to interfere with or circumvent the security features of this site, other websites, or the Internet. We reserve the right to terminate your use of the site for violating any of the prohibited uses. You acknowledge, by your use of this site: (1) that your use of this site is at your sole risk; (2) that you assume full responsibility for all costs associated with all necessary servicing or repairs of any equipment that you use in connection with your use of this site; and (3) that grow will not be liable for any damages of any kind related to your use of or inability to use our site, including, without limitation, failure of performance, error, omission, interruption, computer virus, or network or internet failure, or including, without limitation, direct, indirect, special, compensatory or consequential damages, lost profits and/or loss of or damage to property whether the alleged liability is based on contract, tort, negligence strict liability or any other basis, even if grow has been advised of the possibility of such damages. In no event will Grow’s total liability for any claims related to this site exceed fifty ($50) dollars. Because some jurisdictions do not allow the exclusion or limitation of incidental or consequential damages. Grow’s and its affiliates’, agents’, licensors’ and suppliers’ damages in such jurisdictions shall be limited to the extent permitted by law. The content provided on this site is provided “as is” and “with all faults.” Grow makes no warranty or representation, either express or implied, as to its use, availability, content accuracy, appropriateness or performance of this site. As a user, you assume all risks and responsibilities for its use or non-use, and grow makes no representation that the content appearing on or downloaded from this site is compatible with your computer or free from error or viruses. No grow employee, agent or representative is authorized to modify or amend this warranty. To the extent allowable by existing law, grow disclaims all other warranties, either expressed or implied, including, without limitation, the implied warranties of merchantability and fitness for a particular purpose, with respect to this site and its content. Some jurisdictions do not allow the exclusion or limitation of incidental or consequential damages, or limitation on how long an implied warranty lasts, so the above limitations or exclusions may not apply to you. Grow reserves the right to alter or remove site content, or suspend or terminate your use in any way, at any time, for any reason, without prior notification, and grow will not be liable in any way for possible consequences of that action. You agree to indemnify and hold grow, its directors, officers, employees, agents, contractors, and affiliates harmless from and against any and all claims, damages, costs and expense, including attorney’s fees, arising from or related to your use of this site or breach of these TOU. All users of this site acknowledge and agree that grow, its, officers, managers, directors, as indemnified parties are released, discharged, and held harmless from any and all liability from third-party claims made in connection with your use of the site, including, without limitation, negligence, tort, breach of contract, wrongful death and personal injury, money damages, out-of-pocket and court costs, attorney’s fees, damage to property or reputation, including, without limitation, libel, defamation, right of publicity and invasion of privacy. Grow reserves its right to all forms of equitable and legal relief related to fraud or illegal activity connected to the use of the site. Grow may terminate the TOU at any time and may do so immediately without notice and, accordingly, refuse or terminate your access to the site, if, in Grow’s sole discretion, you fail to comply with any term or condition of the TOU. These TOU will be governed and construed in accordance with the laws of the State of Florida, without regard to its conflicts of law rules. For all disputes arising out of or relating to this TOU, you submit to exclusive personal jurisdiction and venue of the federal or state courts located in Hillsborough County, Florida. When you visit this site or send emails to us, you are communicating with us electronically. You consent to receive communications from us electronically. We will communicate with you by email or by posting notices on this site. You agree that all agreements, notices, disclosures and other communications that we provide to you electronically satisfy any legal requirement that such communications be signed in writing. The provisions and conditions of the TOU constitute the entire agreement between you and Grow related to the use of the site and supersedes any prior agreements or understandings not incorporated in the TOU. The TOU are effective as of the effective date. Continued use of the site by you after the effective date constitutes your acceptance of the TOU after the effective date. Should you have any questions concerning the TOU, or if you desire to contact Grow for any reason, please contact webteam@growfinancial.org.